Religious freedom is a universal human right, 2 one of the foundations of modern democracy. 3 The freedom to have, adopt, manifest, practice, observe, and teach the spiritual doctrine one chooses is extolled in international treaties and protected in the constitutions and laws of many modern democracies. Religious freedom was one of the first human rights to be codified, spurring the evolution and recognition of broader human rights. Yet religious freedom can be taken for granted in modern democracies because it’s been around for generations. This, coupled with a general declining importance of religion 4 for many segments of western societies, can result in apathy, making it easy to miss how this right is being eroded and to ignore the consequences. This is a serious concern, because the importance of religious freedom to the relative liberty we enjoy in modern democracies cannot be overstated. Religious persecution has been rife throughout human history: a look at the past reveals just how valuable religious freedom is, and how tyrannical society can be without it. It also shows it should not be taken for granted, as even when established it’s been brutally disregarded at times. Today, religious liberty continues to exist on paper in the west, but remains threatened by those who perpetuate moral panics, putting minority beliefs at the mercy of mob mentality – a recurring historical trend. 5 The designated slur, and rallying cry, by which alternative groups and teachers are targeted has shifted from “heretic” to “cult”, but the mentality driving the stigmatization is the same. Attacks are rarely physical anymore, but instead employ character assassination through the mass media and internet, 6 the effects of which can be far-reaching in our hyper-connected globalized world, meaning those with heretical or “cultic” beliefs can have their reputations figuratively burnt at the stake in a way not possible before. 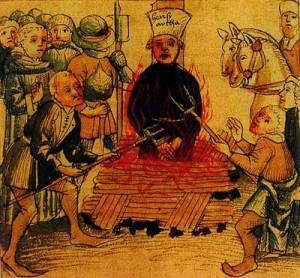 An illustration of a “heretic” burnt at the stake during the Inquisition. This is a modern incarnation of very archaic pattern of discrimination and intolerance, a throwback to persecution of the past. As in the past, this persecution is deemed acceptable when the majority does not share the beliefs of the minorities targeted. Unlike the past, those persecuting don’t always act from a religious standpoint, but through the ideological framing of the secular anti-cult movement. 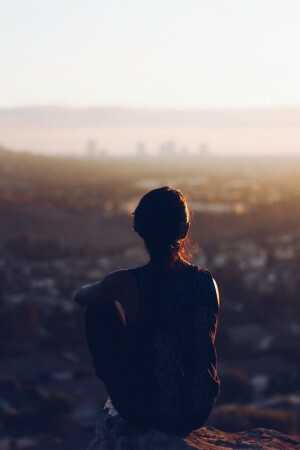 Alternative spiritual groups are most at risk from this modern-day heresy hunting — easily misunderstood, targeted, misrepresented, vilified, and labelled with the “cult” stigma by those with a personal or vested interest in opposing them. Victims of this hostility and intolerance can be turned into virtual pariahs shunned by society, rendering their “religious freedom” essentially meaningless. It is worthwhile to understand the evolution and importance of freedom of conscience as a fundamental right in our society — a right that encompasses the freedom to choose and practice a belief — and to look seriously at the ways this principle is being violated today. Modern manifestations of intolerance not only suppress the rights of those targeted, but tear at the fabric of this fundamental western value underpinning modern democracy and human rights. 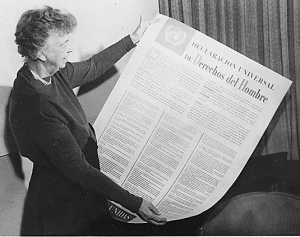 Eleanor Roosevelt holding up the United Nations Universal Declaration of Human Rights in Spanish, 1949. While religious freedom is written into the constitutions of countries in favour of liberty, it is also firmly part of international law through various agreements. After the terrible atrocities of World War II, there was an unprecedented momentum for the international recognition of human rights. The majority of nations in the UN General Assembly formally adopted the Universal Declaration of Human Rights in 1948, a historic landmark. 15 It included many rights such as equality before the law, the right to be held innocent until proven guilty of an offence, the right not to be subjected to arbitrary interference with privacy or to attacks upon one’s honour and reputation, and importantly, the right to “freedom of thought, conscience and religion” which includes the right to manifest one’s “religion or belief in teaching, practice, worship and observance”. However, the Universal Declaration of Human Rights is not legally binding, but is rather more of a guide. However, the International Covenant on Civil and Political Rights, passed in 1966, put a legal obligation on countries who signed it to implement it within their jurisdictions; it has since been ratified by most countries. 16 It provides for freedom from religious discrimination and builds on the Universal Declaration of Human Rights, going further to call for protection against religious discrimination and hate. Article 18 states that, “No one shall be subject to coercion which would impair his freedom to have or to adopt a religion or belief of his choice” and article 20 prohibits the advocacy of “religious hatred that constitutes incitement to discrimination, hostility or violence”. Religious freedom was further clarified in the Declaration on the Elimination of All Forms of Intolerance and of Discrimination Based on Religion or Belief, passed in 1981. 17 It outlines in more detail the rights afforded to religious organizations and officials, such as the right to “solicit and receive voluntary financial and other contributions” and the right to designate “appropriate leaders called for by the requirements and standards of any religion or belief” among others. These rights may seem self-evident today, but it took centuries of repression and the most devastating war in recorded history for countries to collectively recognize these principles. Yet religious persecution has been part of human behaviour for a long time, and the underlying mentality and forces driving it have, unfortunately, not simply disappeared with the advent of modern laws and principles. Christian Cathars stripped and expelled from Carcassonne in the Albigensian Crusade in August 1209. Thousands more were massacred at Béziers the previous month. People can fear the unknown and what they don’t understand. A pattern of persecution has repeated through history that derives from this fear: a dominant segment of society turns against a group with minority beliefs because of their difference, and feels justified in doing so. In pre-modern times, this mechanism was more brutal and obvious: there were religious wars, inquisitions, pogroms, and witch hunts. Over time, roles could shift between persecuted and persecutor depending on who held power. 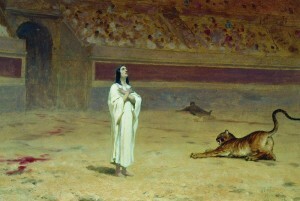 The early Christians were heavily persecuted in Imperial Rome, but later, as the church grew in power and sought to consolidate and control the Christian faith, it persecuted other Christians deemed “heretical” and banned Gospels and scripture that did not fit its doctrine. The persecution of “heretics” became official State policy once the Church became an arm of Imperial Rome. 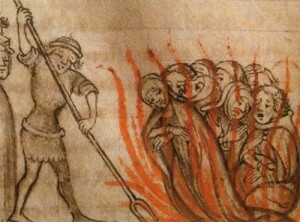 Knights Templar members were forced into false confessions under torture and were burned at the stake in 1314. Persecution of heretics intensified in the middle ages with a military crusade launched by Pope Innocent III to eradicate the Cathars 20 in southern France. This was followed by the institutionalized suppression of spiritual dissent – labelled heresy – through the inquisition. 21 Heretics were hunted down, tortured and put to trial not for committing “crimes” in any objective sense but for allegedly holding, practicing or advocating beliefs that contravened the status quo. Having different spiritual views or beliefs was considered justification enough for the most horrendous violence. Witch trials were another repeating phenomenon by which orthodoxy was enforced, and these materialized after the reformation, in the old and new worlds. In what became a self-fulfilling prophecy, 22 the fact that “witches” were being accused and condemned throughout society was proof enough for many that they really existed and were a threat. Some pursued a fanatical religious agenda against dissent with medieval moral panics, while others simply ruthlessly took advantage of them to falsely accuse enemies for personal gain or to settle scores. Repression has been less overt in Western democratic countries in modern history. But today, moral panics can still be fomented, playing upon the same underlying fear-based mechanism that drove persecution in the past. While more modern examples of persecution are less extreme, the basis — targeting people based on difference — is the same. 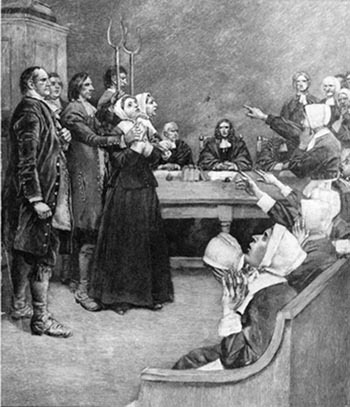 Alleged witches being tried in Salem, Massachusetts, USA during the famous Salem witch hunts of the 17th century. In the persecution of some Christian sects in the US, it was as if the principle of religious freedom was cognitively suspended. Similarly, it can be argued that the inquisition and witch hunts in earlier periods went against the basic religious tenets of those who carried them out. People seem to violate their own moral or legal principles when persecuting others on the basis of their beliefs during times of mass hysteria. Democracy and human rights sought to end this irrational intolerance. But this same pattern of behaviour has found a way to re-emerge and operate behind a mask of legitimacy using the fear and paranoia evoked by the “cult” stigma. The attention paid to minority religious groups is significantly disproportionate to the size and potential impact of the groups, suggesting… a “moral panic”… When this occurs, questions can be raised about who is promoting such a response, and who or what groups gain from development of a moral panic? 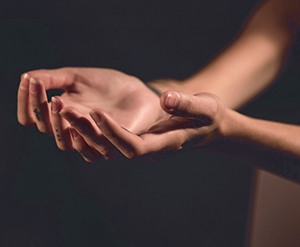 “Cult” is today’s label of choice to stigmatize alternative spirituality, and serves much the same meaning and function as the “heretic” label of the past. A “cultist”, like a “heretic”, is feared and loathed for their unconventional beliefs or practices, and the label comes with a lot of extra baggage attached. As we have seen, the freedom of conscience, encompassing the right to choose and practice a belief, is a fundamental human right, but the anti-cult movement directly opposes this freedom by promoting hysterical views that alternative spiritual groups pose a widespread danger. A more overt way it seeks to strip people of their freedom of conscience is by proposing that members of alternative spiritual groups lack the capacity to make personal choices due to “mind control,” supposedly making their spiritual choices illegitimate. 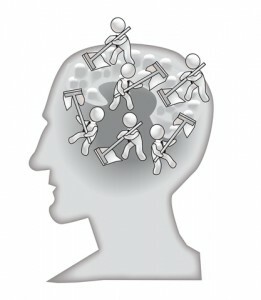 Brainwashing theories are vastly discredited by the scientific community. But these brainwashing theories as popularized by the anti-cult movement have been roundly rejected by scientific and legal consensus. 33 Claiming that a person’s choice to join and remain in a group is the result of “mind control” has no more basis than claiming a heretic’s beliefs were induced by Satan. It is a way of pathologizing non-conformity. But this has not stopped the media from continuing to propagate mind control mythology. These discredited theories have also propelled direct, forcible intervention in the private spiritual affairs of individuals through illegal methods such as kidnapping and private imprisonment of “cult-members” for so-called “deprogramming”. 34 In some cases those kidnapped have been violently abused 35 and even raped. 36 This is in direct violation of not just the freedom of conscience, but other basic human rights to personal liberty, privacy, and safety. It’s a tragic irony that this disturbing behaviour, while not endorsed by all anti-cult movement advocates, occurred at all given the proponents’ chief claims that new religious movements use techniques to coerce people that are unethical. Pathological cognitive dissonance of this kind is not without historical precedent: the forbears of deprogrammers in the inquisition also thought they were acting in the best interests of “heretics” when they tortured and imprisoned them to force them to recant. Given the obvious legal problems with “deprogramming” it has largely fallen out of favour. But the fact it has happened at all in modern democracies demonstrates how the “cult” label can dehumanize a person to the point that direct violations of their personal rights become seemingly justified. The phenomenon of deprogramming is a stark reminder of how those who stigmatize others with the “cult” label serve an agenda diametrically opposed to religious freedom, personal liberty, and human rights — one that draws from a dark historical precedent better left in the dark ages. A more common method to attack “new religious movements” these days is to use the internet to label them as “cults” and to spread damaging rumours anonymously. 37 There exist “bash board” forums specifically for this purpose, to enable people to anonymously attack and discredit spiritual groups. Such forums are often utilized by a small minority of disgruntled ex-members of religious movements with a personal vendetta or score to settle, who wish to harm or damage the reputation of the group or individuals within it for their own reasons. 38 Sometimes this is done with coaching from anti-cultists, and in some cases specific websites are formed to target a single group. But ex-members who do this — also known as apostates — usually have their own not-so-benevolent agendas for vilifying their former group. 39 They typically play the victim and justify themselves with a denunciation using “atrocity stories” that follow a predictable pattern; these same kinds of stories were used in moral panics of the past against spiritual minorities. 40 Ex-member atrocity stories also tend to be publicized uncritically by the media, which greatly amplifies their impact. Over many decades this one-sided media coverage has served to legitimize atrocity stories about new religious movements, and to construct and instill familiar stereotypes. These are reinforced and perpetuated by the dissemination of more atrocity stories fitting the established narrative. But these “atrocity stories” are considered problematic by many scholars, due to well-studied and recurrent ulterior motives at play that cast doubt upon the reliability and objectivity of apostate testimony, and the fact that that the majority of ex-members of religious movement report having a positive experience, as was reported by the Swedish Government in 1998. 41 Given the above, the testimonies of apostates need to be taken with caution by those seeking an objective understanding of a spiritual group that is not tainted with vindictiveness, distortions, and self-centred agendas. Although those giving such testimonials tend to paint themselves as innocent, noble, and truthful, scholarly research has shown that there are many potentially self-interested factors that can motivate such testimony (as can be expected when an individual or group’s sole desire is to discredit or destroy the reputation of a group and those within it) and that such testimony can be significantly influenced by contact with the anti-cult movement. 42 43 44 One must be wary of those who make a hobby of hatred. According to the 2015 Annual Report 46 of the U.S. Commission on International Religious Freedom (USCIRF) (which reports to the US Congress each year in accordance with the 1998 International Religious Freedom Act) the cult label continues to be used to justify the systematic persecution of religious minorities in China. With religious freedom so integral to the foundation of democracy and human rights, those who harbour and vent hostility, intolerance, and prejudice toward spiritual groups and individuals not only violate the rights of the individuals or groups they target, but — in a throwback to the dark ages of religious intolerance — undermine the fundamental principles of human rights, democracy, liberty, and freedom which underpin society. When one considers humanity’s history of religious intolerance, with terrible crimes of hatred committed due to this intolerance, it brings to light just how valuable religious freedom is, and how fortunate we are to live in an era where it’s an established human right. However, if this article started out by saying this right can be taken for granted, it has also shown why we should not be complacent about it, as it is threatened today by those who cloak religious intolerance with seemingly moral pretexts. Today, as in the past, there are those seek to assert their own form of morality while denying practitioners the right to live by the alternative beliefs they choose. As has been shown, often punitive, hostile, hateful, and discriminatory actions are taken against people with alternative beliefs, on the internet or even physically, in violation of human rights principles. There is a clear correlation between anti-cult rhetoric and efforts to quash or wind back protection of freedom of conscience; these efforts constitute a direct attack on democratic values. 59 Ironically, anti-cult propagandists accuse “cults” of violating democratic principles, yet tear at the heart of something so integral to democracy. 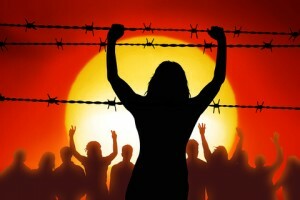 The fact that anti-cult propaganda has been used to justify and mobilize blatant violations of human rights, both in western countries and authoritarian regimes, shows the tyrannical tendency driving the use of this word and why anyone who respects human dignity and religious freedom should be very wary of those who use it. It’s as if those who label and attack others with the “cult” tag are seeking to wipe away the progress humanity has made with religious tolerance and return to a past riddled with persecution, when religious minorities could be targeted without redress. Those who take such actions have on their side a dark legacy of religious hatred, modern totalitarian regimes that are prepared to use anti-cult language to justify oppression, and a network of individuals not averse to using “hate speak” to advance their agenda of religious intolerance. On the other hand, those opposing such intolerance have on their side the principles of liberty, tolerance, religious freedom, democracy, and human rights, representing some of the most just and pivotal achievements of modern history. “International Covenant on Civil and Political Rights.” Office of the United Nations High Commissioner for Human Rights. December 16, 1966. Accessed December 19, 2015. http://www.ohchr.org/en/professionalinterest/pages/ccpr.aspx. Davis, Derek. “The Evolution of Religious Freedom as a Universal Human Right: Examining the Role of the 1981 United Nations Declaration on the Elimination of All Forms of Intolerance and of Discrimination Based on Religion or Belief.” BYU Law Review 2002, no. 2 (2002): 217. CASE OF KOKKINAKIS v. GREECE. 1993 14307/88. European Court of Human Rights. Bailey, Sarah Pulliam. 2015. 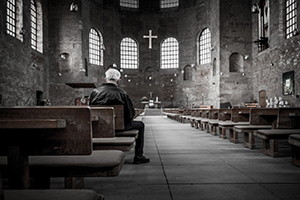 “Christianity Faces Sharp Decline As Americans Are Becoming Even Less Affiliated With Religion”. Washington Post. https://www.washingtonpost.com/news/acts-of-faith/wp/2015/05/12/christianity-faces-sharp-decline-as-americans-are-becoming-even-less-affiliated-with-religion/. Introvigne, Massimo. “Moral Panics and Anti‐cult Terrorism in Western Europe.” Terrorism and Political Violence 12, no. 1 (2000): 47-59. Mccloud, Sean. “From Exotics to Brainwashers: Portraying New Religions in Mass Media.” Religion Compass 1, no. 1 (2007): 214-28. “Freedom of Religion: Essential Principles.” Democracy Web. Accessed December 24, 2015. http://www.democracyweb.org/node/91. “Freedom of Religion: History.” Democracy Web. Accessed December 24, 2015. http://www.democracyweb.org/node/92. “Anti-Christian Policies in the Roman Empire.” Wikipedia. Accessed December 24, 2015. https://en.wikipedia.org/wiki/Anti-Christian_policies_in_the_Roman_Empire. “Inquisition.” Wikipedia. Accessed December 27, 2015. https://en.wikipedia.org/wiki/Inquisition. “First Amendment to the United States Constitution.” Wikipedia. Accessed December 24, 2015. https://en.wikipedia.org/wiki/First_Amendment_to_the_United_States_Constitution. “The Universal Declaration of Human Rights.” United Nations. Accessed December 24, 2015. http://www.un.org/en/universal-declaration-human-rights/index.html. “Declaration on the Elimination of All Forms of Intolerance and of Discrimination Based on Religion or Belief.” United Nations. 1981. Accessed December 24, 2015. http://www.un.org/documents/ga/res/36/a36r055.htm. Stanton, Jamie. “Witch Hunts and the Weaponisation of Moral Panic.” Medium. February 26, 2015. Accessed December 24, 2015. https://medium.com/@djamiestanton/witch-hunts-and-the-weaponisation-of-moral-panic-892e6be0c82d#.4fcl8ic82. Lewis, James R. “Atrocity Tales as a Delegitimation Strategy.” In Legitimating New Religions. New Brunswick, N.J.: Rutgers University Press, 2003: 155-174. “Albigensian Crusade.” Wikipedia. Accessed December 24, 2015. https://en.wikipedia.org/wiki/Albigensian_Crusade. “Inquisition.” Wikipedia. Accessed December 24, 2015. https://en.wikipedia.org/wiki/Inquisition. “Self-fulfilling Prophecy.” Wikipedia. Accessed December 24, 2015. https://en.wikipedia.org/wiki/Self-fulfilling_prophecy. Davis, Kenneth. “America’s True History of Religious Tolerance.” Smithsonian Magazine, October 1, 2010. http://www.smithsonianmag.com/history/americas-true-history-of-religious-tolerance-61312684/?all&no-ist. “The Persecution of Jehovah’s Witnesses.” 1941. Accessed December 24, 2015. http://debs.indstate.edu/a505p4_1941.pdf. Robinson, B. A. “Cults (a.k.a. New Religious Movements): Introduction.” Ontario Consultants on Religious Tolerance. December 1, 2011. Accessed December 24, 2015. http://www.religioustolerance.org/cultintro.htm. Lewis, James R. Legitimating New Religions. New Brunswick, N.J.: Rutgers University Press, 2003: 200. Sean McCloud notes, “One scholar credits the ACM with creating the category ‘cult’ and suggests that ‘print and broadcast media for the most part uncritically accepted the ACM’s analysis’ of new religions (Greil 1996, 56–57; see also Richardson 1993).” Mccloud, Sean. “From Exotics to Brainwashers: Portraying New Religions in Mass Media.” Religion Compass 1, no. 1 (2007): 216. Lewis, James R. Legitimating New Religions. New Brunswick, N.J.: Rutgers University Press, 2003: 201. Lewis, James R. Legitimating New Religions. New Brunswick, N.J.: Rutgers University Press, 2003: 206. For discussion, see Introvigne, Massimo. “The American Psychological Association, Brainwashing Controversies and the Great Cult Apologist Conspiracy.” In Challenging Religion, edited by James A. Beckford and James T. Richardson, 74-82. London: Routledge, 2003. Melton, J. Gordon. “Brainwashing and the Cults: The Rise and Fall of a Theory.” CESNUR. 1999. Accessed December 24, 2015. http://www.cesnur.org/testi/melton.htm. LeMoult, John E. “Deprogramming Members of Religious Sects.” Fordham Law Review 46, no. 4 (1978): 599-640. Shupe, Anson. “Deprogramming Violence: The Logic, Perpetration, and Outcomes of Coercive Interventions.” In Violence and New Religious Movements, 397-412. New York: Oxford University Press, 2011. Fefferman, Dan. “Forced Conversions of Unificationists in Japan: A Continuing Human Rights Violation.” Journal of Unification Studies 13 (2012): 21-32. Accessed December 24, 2015. http://www.journals.uts.edu/volume-xiii-2012/178-forced-conversions-of-unificationists-in-japan-a-continuing-human-rights-violation. Introvigne, Massimo. “”So Many Evil Things”: Anti-Cult Terrorism via the Internet.” CESNUR. 1999. Accessed December 24, 2015. http://www.cesnur.org/testi/anticult_terror.htm. Introvigne, Massimo. “Religious Liberty in Western Europe.” CESNUR. 1997. Accessed December 24, 2015. http://www.cesnur.org/testi/Washington.htm. “Media Sensationalism and Apostasy: A Destructive Synergy.” FIRM: Foundation against Intolerance of Religious Minorities. Accessed December 24, 2015. http://www.firmstand.org/articles/apostasy.html. Lewis, James R. “Apostates and the Legitimation of Repression: Some Historical and Empirical Perspectives on the Cult Controversy.” Sociological Analysis 49, no. 4 (1989): 386-96. “Report of the Swedish Government’s Commission on New Religious Movements (1998).” CESNUR. 1998. Accessed December 25, 2015. http://www.cesnur.org/testi/swedish.htm. Kliever, Lonnie. The Reliability of Apostate Testimony about New Religious Movements. Freedom Publishing, 1995. Bromley, David G., ed. The Politics of Religious Apostasy the Role of Apostates in the Transformation of Religious Movements. Westport, Conn.: Praeger, 1998. Robinson, B. A. “Religious Oppression and Intolerance in China.” Religious Tolerance. 2005. Accessed December 25, 2015. http://www.religioustolerance.org/rt_china.htm. “Annual Report of the U.S. Commission on International Religious Freedom.” U.S. Commission on International Religious Freedom. 2015. Accessed December 25, 2015. http://www.uscirf.gov/sites/default/files/USCIRF%20Annual%20Report%202015%20%282%29.pdf. Lin, Luna, and Tom Phillips. “China’s Christians Protest ‘evil’ Communist Campaign to Tear down Crosses.” The Guardian, July 27, 2015, World sec. Accessed December 25, 2015. http://www.theguardian.com/world/2015/jul/27/chinas-christians-protest-evil-communist-campaign-to-tear-down-crosses. “Organ Harvesting from Falun Gong Practitioners in China.” Wikipedia. Accessed December 25, 2015. https://en.wikipedia.org/wiki/Organ_harvesting_from_Falun_Gong_practitioners_in_China. Fefferman, Dan. “Religious Freedom and the Anti-Cult Movement.” International Coalition for Religious Freedom. Accessed December 25, 2015. http://www.religiousfreedom.com/index.php?option=com_content&view=article&id=404&Itemid=399. Roux, Eric. “Mistreatments of Religious Minorities: The French Model.” European Interreligious Forum for Religious Freedom. 2013. Accessed December 25, 2015. http://www.eifrf-articles.org/Mistreatments-of-religious-minorities-the-French-Model_a67.html. Thierry, Bécourt. “France: Religious Minorities Stigmatized as ‘mutating Viruses’ and ‘pathology of Belief’.” Organization for Security and Co-Operation in Europe. 2010. Accessed December 25, 2015. http://www.osce.org/home/71540?download=true. Bosco, Joseph A. “China’s French Connection.” Washington Post, July 10, 2011. Bouma, Gary. “Cults Are the Cost of Open Society.” ABC, November 11, 2011, Religion and Ethics sec. Accessed December 25, 2015. http://www.abc.net.au/religion/articles/2011/11/15/3366349.htm. “Global Restrictions on Religion.” Pew Forum on Religion & Public Life. 2009. http://www.pewforum.org/files/2009/12/restrictions-fullreport1.pdf: 15. “Global Restrictions on Religion.” Pew Forum on Religion & Public Life. 2009. http://www.pewforum.org/files/2009/12/restrictions-fullreport1.pdf: 58. Freedom of Religion: A Report with Special Emphasis on the Right to Choose Religion and Registration Systems. Forum 18. 2001. Accessed December 25, 2015. https://web.archive.org/web/20130325053700/http://forum18.org/PDF/freedomofreligion.pdf.